Who would not want an application that helps them save money while shopping online? WindowPromo comes forth promising to be that application, but we are very sorry to tell you it is not what it purports to be. This program is an adware application, and, as such, it is involved in third-party advertising that could prove to be detrimental to your system’s security. There are many security issues related to third-party advertising, so, before it is too late to do anything about it, make sure you remove WindowPromo from your system and then invest in a powerful antispyware tool to protect it from other intruders. We are not trying to say that WindowPromo infected your system surreptitiously. Adware programs cannot really get installed on target computers unless the users set them up themselves. It is possible not to be aware of the programs you are installing on your computer when these programs come in packs. For instance, adware and freeware applications often get distributed in software bundles. Our research shows that WindowPromo usually comes with Emotiplus and other similar applications that offer emoticon sets for Skype and other online messaging programs. The point is that you might think you are downloading this one program only, but the truth is that the installer file has several other apps bundled within, and, if you breeze through the setup without reading all the important steps, WindowPromo and similar unwanted applications get installed on your PC. The adware is targeted at French-speaking users, just like the Securery.com browser hijacker, which happens to be created by the same developers at Development Media 73. However, this does not mean that WindowPromo can affect only computers belonging to French-speaking users. If you wander around in websites that are part of the adware distribution network, it is very likely that you could end up with this adware app on your system. What does WindowPromo do? The program is created to generate financial profit for its developers. It is not a malicious Trojan or ransomware application, so it does not log your keystrokes or try to push you into giving away your money for nothing. WindowPromo actually employs the pay-per-click system to make money by redirecting you to affiliated third-party websites. The application is supposed to help you compare prices of the same product across various online shops without additional browsing. However, it all boils down to displaying commercial third-party ads in hopes that you would click them. Adware programs need your clicks because this is how you help them stay afloat. Unfortunately, WindowPromo and other similar applications cannot be held responsible for the security of the third-party content. Thus, if cyber criminals decide to make use of this application to promote their own website content, you could end up landing on a site that is part of a malware distribution system. What’s more, WindowPromo could not be blamed for it because you would have clicked the link yourself! Thus, to avoid such undesirable consequences, you need to remove WindowPromo right now. Uninstall this application via Control Panel and then check for other unfamiliar programs. If you are not sure you can find all the potential threats, scan your PC with the SpyHunter free scanner. Open Uninstall a program and remove WindowPromo. Go to Uninstall a program and remove WindowPromo. 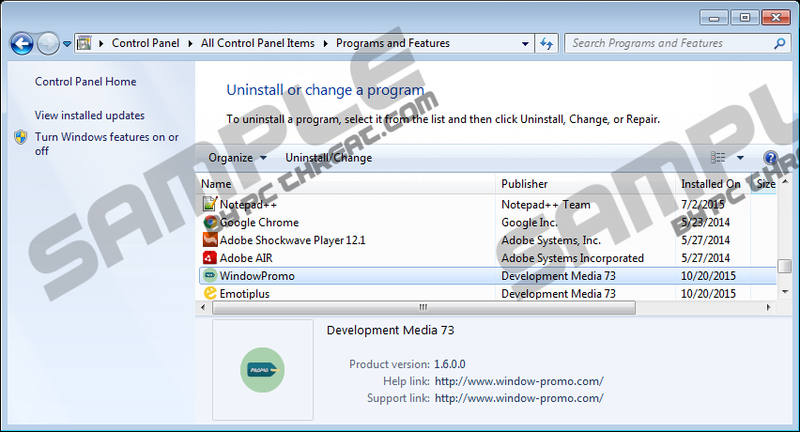 Select Add or remove programs and uninstall WindowPromo. Quick & tested solution for WindowPromo removal.